As if we didn't see this coming. We've heard and watched him reiterate his aversion to the idea, but the popular mayor of Davao City, Rodrigo Duterte, seems to have had a (predictable) change of heart, as it was recently reported that he is now going to heed the public's call and will finally run for president in next year's national elections. An unnamed source told Inquirer.net that Duterte met with former President Fidel Ramos last Monday, wherein he disclosed his willingness to hit the campaign trail come May 2016. We might or might not have seen this coming, but Duterte being able to stay in the public's consciousness—even with his method of seemingly avoiding campaigning, including those cheesy TV guestings—was definitely a good PR move, leading to a highly ostensible candidacy. "If I'm the president, I will declare a revolution. I will rebel against my own government and close down everything except your businesses and make a body to take care of your expenses." 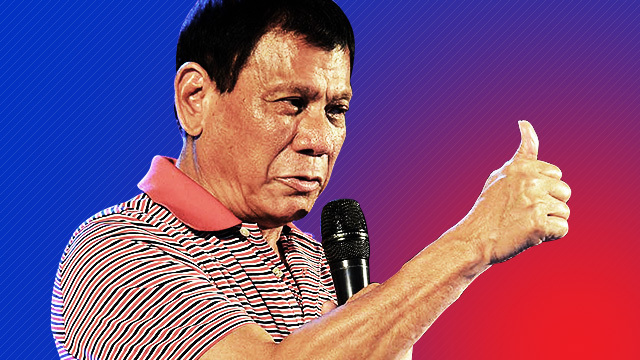 He continued, "Lumalabas na sa mga website eh, Duterte for president. You must be crazy. I said I am not interested to be president. I am not qualified to be president. I cannot dream of what I cannot be but I can only aspire for what I can be." With the constant prodding for him to run for higher office, Duterte told reporters September last year, "I intend to retire (from politics) after this term. Gusto ko na mag-retire, matanda na ako. I hope this would end speculations about (me running for) President, vice president, senator." He instead vouched for former presidentiable Gilbert "Gibo" Teodoro, saying the latter is most qualified to be vice president, after Sen. Miriam Santiago expressed her preference towards Duterte being her running mate if ever she pushes through with her plans to run for president in 2016. "I don’t know who started it but if I knew him, I would want to kill him," the tough-as-nails mayor was quoted on the Sunday morning show, Gikan Sa Masa, Para Sa Masa. He also warned those people who wish to pitch in for his supposed presidential run, saying they might be duped by certain groups. "Do not get swayed. I’m not running, I don’t need your money." And in true Duterte fashion, he ended the interview with this bold statement: "I would rather die early than enter Malacañang." During the recent ASIA CEO Forum in Makati, Duterte once and for all revealed the reason why he is reluctant to run in 2016. "I'm not running for President and I never wanted to be one.... Ayaw ko talaga. Ayaw ng pamilya ko pati iyong anak ko na mayor and she's vocal about it," he explained, referring to his daughter Sara Duterte-Carpio. "I said before (that) I do not covet the position, I don't want it. My stand is still the same."